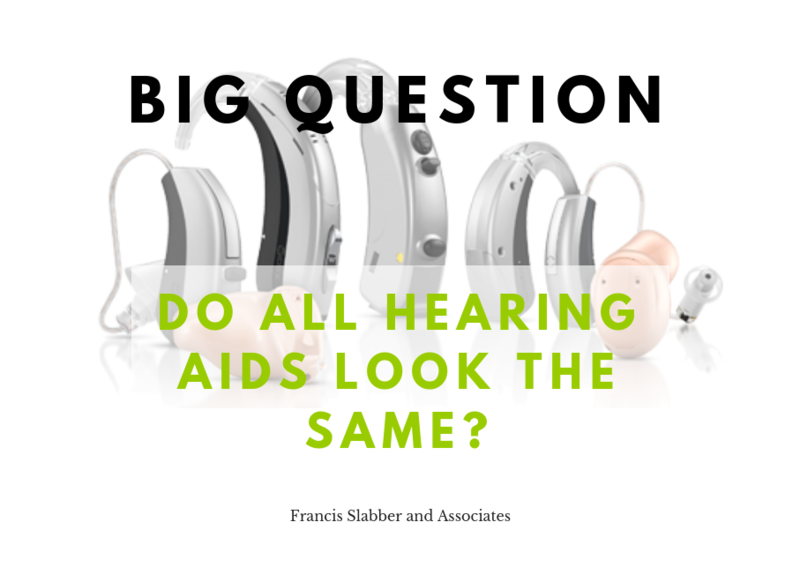 Do All Hearing Aids Look The Same? Every person has different concerns when considering hearing aids, but there are a few questions that are almost universally asked. One of them is ‘What will the hearing aid look like?’. Many people expect that hearing aids are all the same- that they will need to get hearing aids that look the same as the ones their grandmother, spouse, or neighbour wears. This is not the case- in fact, there are a whole range of different hearing aid styles and looks. There are three main styles of hearing aids, each with their own strengths and weaknesses. Behind-The-Ear (BTE). The BTE hearing aid was once the most commonly fitted style of hearing aid. All the technology of the hearing aid sits behind the ear, and the sound is transmitted into the ear via an open tube. Once BTEs were big, but these days most people don’t need the aid to be very large. A BTE hearing aid is easy to handle and to see for people with eyesight issues, and because there is no technology in the ear, it is best for people with heavy wax production or who get regular fluid-producing ear infections. It’s also the style that allows enough amplification for those with very severe hearing loss. In-The-Ear (ITE). The ITE hearing aid has all components of the aid sitting inside the ear canal and/or the shell of the concha or outer ear. ITEs are not normally suitable for people with severe losses, or those with normal low frequency hearing, as they almost ‘close’ the ear, increasing natural low frequency resonance. ITE aids can be nice for people with milder losses and for those who discretion is important. However, they are almost always completely custom made, which means that changes in ear canal size or shape can be very inconvenient. Receiver-In-the-Canal (RIC). The RIC hearing aid has the battery, microphones, amplifier and processor behind the ear, and the receiver (or speaker) deep in the ear canal, connected by a thin wire. Because the receiver is separate, it allows the aid to be very small and discrete. RIC aids are very flexible, and can be suitable for almost any hearing loss with the right set up. However, because the receiver is in the ear canal it is more vulnerable to wax and moisture, and filter changes can be tricky for people with poor hand function or reduced eyesight. Within each style category there are dozens of different designs. In addition, the hearing aids all have a range of colour options and different acoustic setups that all look slightly different. For this reason it is rare to have two people who know each other with hearing aids that look exactly the same. Hearing aids should always be selected in consultation with a hearing healthcare professional who can advise on the best style for you. We take into account the acoustics that your hearing loss requires, the shape and size of your ears and ear canals, physical limitations such as peripheral neuropathy or arthritis, your ability to see, your personal wax production, your required battery life, and your personal design preference. Sadly, one of the main reasons that people end up not hearing well or not using their hearing aids is because they chose a hearing aid style that was not suitable for their needs- this is why an open discussion with your audiologists about all factors should always be completed before purchasing hearing aids. Do you have any questions or experiences about hearing aid styles? Comment below or contact us for more information.